Objectives: To report on unique cases of spinal compression fractures due to pregnancy associated osteoporosis (PAO) and to suggest a satisfactory treatment modality. Materials and Methods: A single center retrospective study. We reviewed the data of 535 patients with osteoporotic spinal compression fractures over a period of 5 year. Two patients who developed spinal compression fractures due to PAO were identified and treated. Results: The clinical presentation and blood investigations ruled out other causes of osteoporosis. 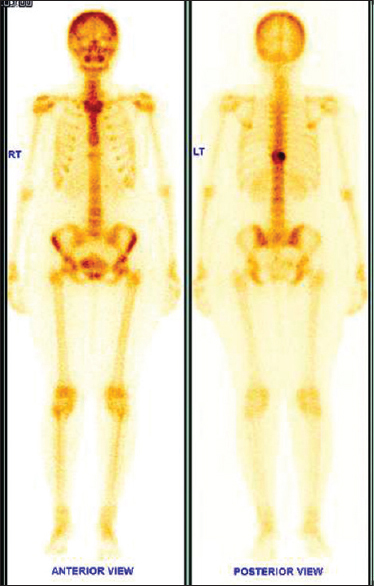 Dual energy X ray absorptiometry was used to confirm the diagnosis. All patients improved with medical management. Conclusion: Vertebral fractures due to PAO should be considered as a differential diagnosis in patients with back pain who are in the third trimester of pregnancy or in postpartum. Early recognition and appropriate conservative management would be necessary to prevent complications such as new vertebral fractures and chronic back pain. Keywords: Bone mineral density; chronic back pain; dual energy X ray absorptiometry; pregnancy associated osteoporosis; spinal compression fractures. Osteoporosis commonly affects an older demographic and has a higher prevalence among females in postmenopausal age group. It is the most common cause of fractures among the elderly. The pathological mechanism may either be an increased loss of bone mass or a decreased density of the bone. Multiple etiological factors are related to osteoporosis such as genetic, hormonal, and nutritional. However, osteoporosis is not entirely a disease of the old age, and can, in relatively rare instances, manifest in pregnancy and postpartum, which was first described by Albright and Reifenstein in 1948. The etiology and pathogenesis of this condition are still under evaluation. In pregnancy induced osteoporosis, fragility fractures involving vertebrae were described by Nordin and Roper in 1955. These compression fractures are seldom recognized because the clinical features commonly attributed mechanical back pain to pregnancy. An agreed guideline on the treatment of pregnancy associated osteoporosis (PAO) has not been found. This study was conducted with the aim to report on this phenomenon and demonstrate a likely treatment modality with satisfactory results. Retrospective analysis of single center data of patients diagnosed to have thoracolumbar spine fractures due to PAO from January 2010 to December 2014. Of the 535 patients with osteoporotic spinal compression fractures, two patients had spinal compression fractures secondary to PAO. A 27 year old primipara patient presented at the 3rd month of postpartum. She complained of low back pain since the 8th month of pregnancy. Following delivery, she also noticed the loss of height. She had left sided radiculopathy with sensory blunting over L5 dermatome. Blood investigations revealed serum calcium 7.1 mg/dl, phosphorus 3.5 mg/dl, parathyroid hormone (PTH) 94.2 pg/ml, and Vitamin D3 18.01 ng/ml. Computed tomography (CT) scan shows D10 compression fracture [Figure 1] and [Figure 2]. Bone scan showed increased tracer uptake in D10 vertebra and rest of the skeleton shows with normal tracer distribution [Figure 3]. A 31 year old primipara known case of scoliosis presented at the 5th month of postpartum. She complaints of low back pain since 1st month of postpartum with no radiculopathy. Blood investigations revealed serum calcium 8.3 mg/dl, phosphorus 3.7 mg/dl, PTH 61.6 pg/ml, and Vitamin D3 15.08 ng/ml. CT scan and magnetic resonance imaging showed compression fracture of D12, L1, and L2 vertebra. Vitamin D 800 IU/day, alendronate 70 mg/week, and thoracolumbar orthosis. Dual energy X ray absorptiometry (DEXA) scan was done before starting the therapy and at 2 years follow up time [Table 1]. The second patient developed sternum into abdomen deformity. This patient appeared very thin due to inadequate food intake with good appetite and refused surgery for correction of the deformity. The "Sternum into Abdomen" deformity was first reported by Krishnakumar and Lenke, referring to the presentation of severe kyphosis due to osteoporotic compression fractures of the spine, resulting in extrinsic gastric compression severe enough to cause weight loss. Both the patients had a significant improvement in bone mineral density (BMD) with the treatment and did not develop any new compression fracture or complications during the 2 years follow up period. Antiresorptive therapy with bisphosphonates results in rapid improvement even in younger patients. The gain in BMD was greater when bisphosphonate therapy was initiated early, and a significant gain occurs at the lumbar spine. Combined use of bisphosphonates with osteoanabolic agents like teriparatide gives better results and fewer complications rather than bisphosphonates alone. PAO is not a contraindication for subsequent pregnancy and in fact, subsequent pregnancies may not give rise to PAO., Bisphosphonates are agents which accumulate in bone for years and can cross the placenta. Long term prenatal side effects of bisphosphonates are not known, so women who wish to have subsequent pregnancy is better treated with teriparatide. Strontium ranelate, which is a newer treatment option for postmenopausal osteoporosis, has the dual effect of reducing the bone resorption and increasing the new bone formation, and it is not stored in bone. A few studies support the use of strontium ranelate in PAO, however long term results are not available. Spinal compression fracture due to PAO is a rare clinical condition; it should be considered as a differential diagnosis when thoracic or lumbar pain occurs during pregnancy or in the postpartum period. Early recognition and adequate treatment prevent the complications such as new fractures and chronic back pain. F Albright, EC Reifenstein. The parathyroid glands and metabolic bone disease. Selected studies. Am J Med 1949;7:844. Nordin BE, Roper A. Post pregnancy osteoporosis; a syndrome? Lancet 1955;268:431 4. Krishnakumar R, Lenke LG. 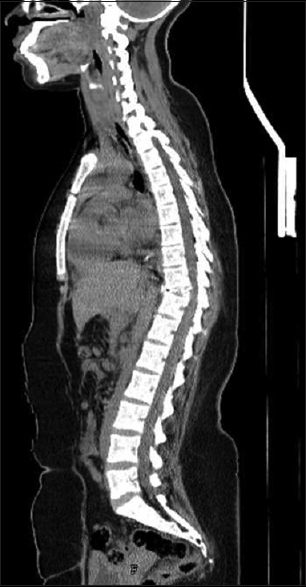 Sternum into abdomen deformity with abdominal compression following osteoporotic vertebral compression fractures managed by 2 level vertebral column resection and reconstruction. Spine (Phila Pa 1976) 2015;40:E1035 9. O'Sullivan SM, Grey AB, Singh R, Reid IR. Bisphosphonates in pregnancy and lactation associated osteoporosis. Osteoporos Int 2006;17:1008 12. Dunne F, Walters B, Marshall T, Heath DA. Pregnancy associated osteoporosis. Clin Endocrinol (Oxf) 1993;39:487 90. Davey MR, De Villiers JT, Lipschitz S, Peltifor JM. Pregnancy and lactation associated osteoporosis. JEMDSA 2012;17:149 53. Kim TH, Lee HH, Jeon DS, Byun DW. Compression fracture in postpartum osteoporosis. J Bone Metab 2013;20:115 8. Kovacs CS, Kronenberg HM. Maternal fetal calcium and bone metabolism during pregnancy, puerperium, and lactation. Endocr Rev 1997;18:832 72. Kalkwarf HJ, Specker BL. Bone mineral changes during pregnancy and lactation. Endocrine 2002;17:49 53. Kovacs CS. Calcium and bone metabolism during pregnancy and lactation. J Mammary Gland Biol Neoplasia 2005;10:105 18. Laskey MA, Prentice A. Bone mineral changes during and after lactation. Obstet Gynecol 1999;94:608 15. More C, Bettembuk P, Bhattoa HP, Balogh A. The effects of pregnancy and lactation on bone mineral density. Osteoporos Int 2001;12:732 7. Khovidhunkit W, Epstein S. Osteoporosis in pregnancy. Osteoporos Int 1996;6:345 54. Buppasiri P, Lumbiganon P, Thinkhamrop J, Ngamjarus C, Laopaiboon M. Calcium supplementation (other than for preventing or treating hypertension) for improving pregnancy and infant outcomes. Cochrane Database Syst Rev 2011;2:CD007079. Prentice A, Jarjou LM, Cole TJ, Stirling DM, Dibba B, Fairweather Tait S. Calcium requirements of lactating Gambian mothers: Effects of a calcium supplement on breast milk calcium concentration, maternal bone mineral content, and urinary calcium excretion. Am J Clin Nutr 1995;62:58 67. Dror DK, Allen LH. Vitamin D inadequacy in pregnancy: Biology, outcomes, and interventions. Nutr Rev 2010;68:465 77. Kazemi A, Sharifi F, Jafari N, Mousavinasab N. High prevalence of Vitamin D deficiency among pregnant women and their newborns in an Iranian population. J Womens Health (Larchmt) 2009;18:835 9. Phillips AJ, Ostlere SJ, Smith R. Pregnancy associated osteoporosis: Does the skeleton recover? Osteoporos Int 2000;11:449 54. Hellmeyer L, Kühnert M, Ziller V, Schmidt S, Hadji P. The use of i. v. bisphosphonate in pregnancy associated osteoporosis - Case study. Exp Clin Endocrinol Diabetes 2007;115:139 42. Tanriover MD, Oz SG, Sozen T, Kilicarslan A, Guven GS. Pregnancy and lactation associated osteoporosis with severe vertebral deformities: Can strontium ranelate be a new alternative for the treatment? Spine J 2009;9:e20 4. Terzi R, Terzi H, Özer T, Kale A. A rare cause of postpartum low back pain: Pregnancy and lactation associated osteoporosis. Biomed Res Int 2014;2014:287832. Ornoy A, Wajnberg R, Diav Citrin O. The outcome of pregnancy following pre pregnancy or early pregnancy alendronate treatment. Reprod Toxicol 2006;22:578 9. Bone mineral density; chronic back pain; dual energy X ray absorptiometry; pregnancy associated osteoporosis; spinal compression fractures.